So, now I am a photographer. Le-git. “So, now you are a photographer,” said my mom, when I called her to tell her the news. As if winning a contest of some sort adds to my credibility of being a photographer. “Yeah… I guess so.” I said with casual nonchalance. Friend: Hey, there is a photography contest at Queen’s. You should enter something. Friend: Today! I just got the email. It was a Monday and I had so much lined up. There was my class at 10am. Then, a meeting with a student. And then, those books I had to hunt down at the library for a presentation I was doing on campus the following week (on Bollywood Item Girls, which is a whole other story by itself)… I wasn’t even sure if I would have the time to send anything in by their 11:59 pm deadline. But I did. Five minutes before the clock struck 12. Me, the last-minuter. Living life on the edge. The contest, organized by Queen’s University International Centre, was in its 5th year. Open to both undergraduate and graduate students, the demand was for “international” photos. We could submit a maximum of 2 images in 2 different categories. A week after the submission, while I was in Edmonton for a conference, I got an email. Congratulations, it said. From 250 photo submissions, both of my photographs had made it in. While “Fervour” won second place in the “People and Culture” category, “Together, we can” won first place in the “Critical Global Issues” one. Taken at the evening prayers on the riverbanks of Ganges in the city of Varanasi, this photo of a young priest in the midst of his daily prayers, along with many other priests, is a regular occurrence. 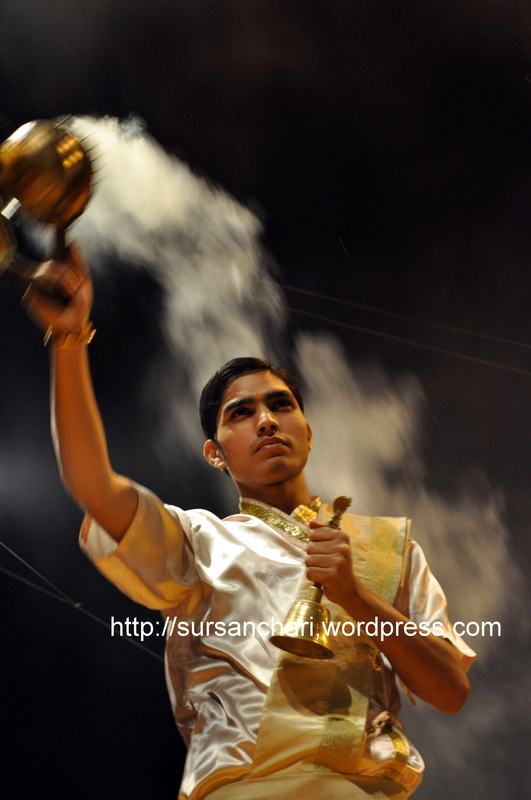 However, it was the look of devotion on his face, even amidst the rituals, that I had to capture a photograph of that expression. While on a photowalk with a local photography club, “Kolkata Weekend Shoots,” I found myself in the largest wholesale market in Kolkata, also known as “Kolay Market”. 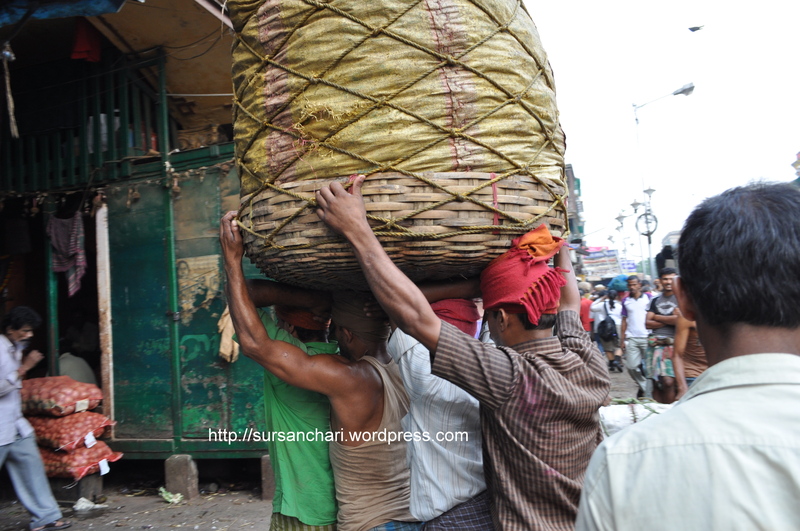 While leaving the claustrophobic ambiance of the market, my attention was arrested by the shouts of these four men who were struggling to carry a huge load on their heads. I was both amazed and paralyzed by the sight. The photo represents the hardships of the working class in Kolkata. Today at their Gala exhibition/event, I got a bunch of gift certificates (read: m-o-n-e-y) and huge blown up versions of my winning photos. I have to admit it. The blown up versions have me most excited about winning this contest. If you are a student and an aspiring photographer in Canada, you know it’s goddamn expensive to blow up your photos. So, am I a photographer? If you happen to be in Kingston, Ontario, check out the photos (along with other winning photos) at the Queen’s University International Centre on the Queen’s campus. They will be displayed (along with their descriptions) for the next two weeks.